Shamrock shakes are the bright green, vanilla and mint flavored milkshakes that McDonald’s rolls out in the USA for St Patrick’s Day every year. The shakes have something of a cult following, even among people who aren’t usually getting milkshakes at McD’s. 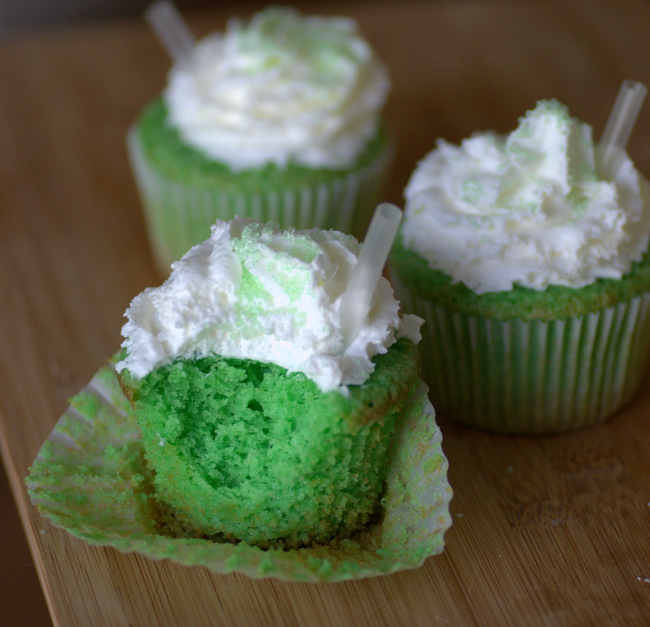 These Shamrock Shake Cupcakes are inspired by the seasonal shakes and are a fun dessert to serve up around St Patrick’s Day. The cupcakes are buttermilk cupcakes flavored with vanilla and peppermint extracts, then dyed with green food coloring. Vanilla and peppermint is a great combination that gives the cupcakes a sweet, round minty flavor, rather than making them taste like mouthwash, which can happen if you are overzealous with your peppermint extract. For the food coloring, you can use either a liquid coloring or a gel coloring. The gels are more intense and you won’t need to use as much to get your desired color, but liquid colorings are more widely available at grocery stores and are still a good choice. You’ll have to eyeball the color as you add the dye to get the color you want, however, as food coloring varies a bit by from manufacturer. The cupcakes are moist, dense and flavorful, with just the right amount of mint. I used lightly sweetened whipped cream instead of regular frosting as a nod to the real milkshakes. Whipped cream is light and contrasts well with the cupcakes. You can use homemade whipped cream, but storebought does the job here just fine. The unfrosted cupcakes can be stored in an airtight container for at least a day or two before serving, if you want to make them ahead of time, but the whipped cream needs to be applied right before serving because it won’t hold up at room temperature for long periods of time. Add a few green sprinkles and a short straw before serving, then enjoy! Preheat oven to 180C (350F). Line a 12 hole muffin tin with paper liners. In a medium bowl, stir together the flour, baking powder, bicarbonate of soda and salt. In a large bowl, cream together butter and sugar until pale and creamy, then beat in eggs, vanilla extract, peppermint extract and green food coloring until ingredients are well combined. Add additional green food coloring as needed. Stir in half of the flour mixture, followed by the buttermilk. Mix in the remaining half of the flour mixture, stirring until no streaks of dry ingredients remain visible. Divide mixture evenly into the prepared muffin cases. Bake for 16-20 minutes or until cupcakes are set and a toothpick inserted into the center of a cupcake comes out clean or with only a few moist crumbs attached. Turn out onto wire rack to cool completely. When you are ready to serve the cupcakes, top each with whipped cream and green sprinkles. Do not “frost” cupcakes until ready to serve. For other St Patrick’s Day cake inspirations, take a look at our round up of all things green here!